The latest fiasco is the Great Christmas Ornament Scandal. On Tuesday, Andrew Breitbart’s Big Government blog got its knickers in a twist over one of the Obama White House’s myriad Christmas trees. (Big Government is a sibling to Breitbart’s Big Hollywood blog, which cranked up a paranoid fantasy about the National Endowment for the Arts a few months back.) The blaring “EXCLUSIVE” led with a blurry photo of a decoupage Christmas ornament adorned with the face of Chinese Communist dictator, Mao Zedong. “Of course, Mao has his place in the White House,” Big Government wailed about the GCOS, taking the Obama-as-socialist meme out for a yuletide spin. 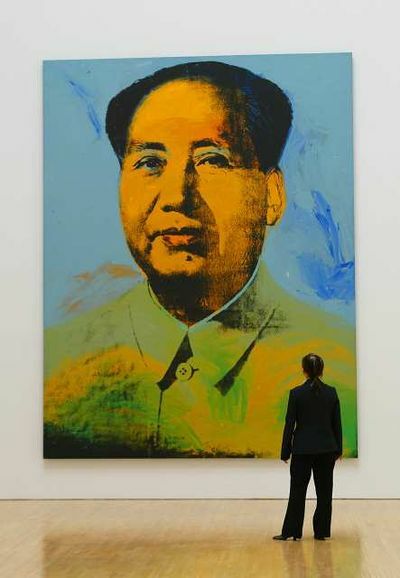 The image is one of a very large series of silkscreen paintings and prints the late Pop artist made of Mao. Warhol’s parody transformed the leader of the world’s most populous nation into a vapid superstar — the most famous of the famous. The portrait photo from Mao’s Little Red Book is tarted up with lipstick, eye-shadow and other Marilyn Monroe-style flourishes.